This is a new, improved, and redesigned product for teaching common negative prefixes: un-, dis-, non-, in-, im-, il-, ir-. 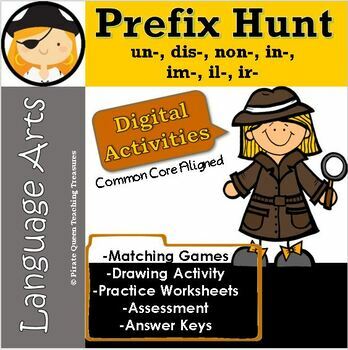 Because students need repeated interaction with content they are learning, there are a variety of activities included in this product to engage students with words using these prefixes. Two sets of prefixed words are provided. For each set of words, there are five activities that require students to process word meanings in a variety of ways. First students are introduced to seven words one for each of the seven negative prefixes. 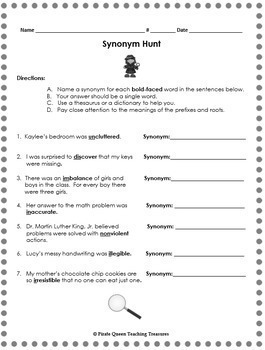 Students read sentences in which the words are used and must determine word meanings by using their knowledge of the prefixes and roots as well as the context of the sentences. Once word meaning has been determined, students draw pictures to illustrate the meaning of each word. Next, students use the dictionary and thesaurus to find synonyms. The last two activities are matching games. 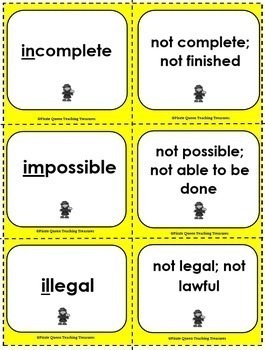 Students match the words with their definitions for one game, and for the other they match the words with sentences in which the words can be used. Thank you for considering this product. If you choose to purchase, your feedback is appreciated. 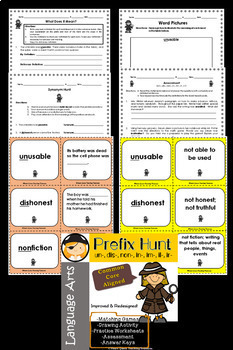 Take a look at this FREEBIE matching game to help your students learn the top 20 common prefixes. Click here for more treasure!